circuitry configured to transmit control and data channels using a variable band including a second plurality of subcarrier groups, wherein the variable band includes at least the core-band. In its Institution Decision, the Board provided a preliminary construction of “transmit[ting] a broadcast channel in an orthogonal frequency division multiple access (OFDMA) core-band.” (Institution Decision, p. 11.) The Board stated: “the plain meaning of transmitting a broadcast channel in a core-band merely requires transmitting some part of the broadcast channel in a core-band and does not exclude transmitting another part of the broadcast channel outside the core-band.” Id. IV disagreed with the Board’s preliminary construction, asserting that an ordinarily skilled artisan would have understood the limitation to exclude transmitting any portion of the recited broadcast channel outside of the core-band. (Patent Owner Resp., pp. 35–36.) According to the Board, Ericsson did not agree with or dispute IV’s assertion, and only asserted that IV’s proposed construction adds no clarity and that no construction is necessary. Upon further review of the ’431 patent, particularly in view of Patent Owner’s arguments supported by Dr. Zeger’s testimony discussed above, we are persuaded that our preliminary partial construction was unreasonably broad to the extent that construction indicated the transmitting a broadcast channel limitation would be met by the transmission of a broadcast channel that is only partially within the core-band. 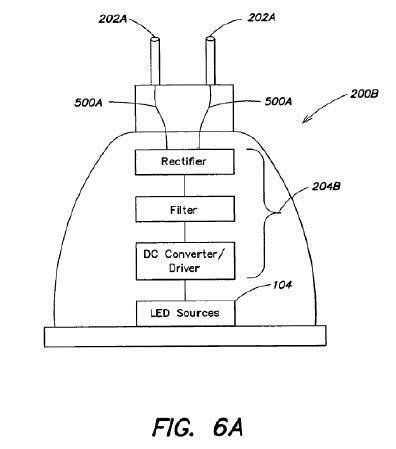 Thus, we agree with Patent Owner that to show that the transmitting “a broadcast channel in an” OFDMA core-band limitation is met, Petitioner must demonstrate that the prior art teaches or suggests transmitting a broadcast channel, wherein the entire channel is contained within the core-band. (Final Written Decision, pp. 8-9.) The Board determined that Ericsson’s prior art combination failed to teach transmitting a broadcast channel in an OFDMA core-band, as recited in independent claims 8 and 18. The Board found that a particular prior art reference (Yamaura) did transmit in the OFDMA core-band at times, but it did not have sufficient evidence that at other times it did not transmit outside of that band, and therefore it did not teach the recited OFDMA core-band limitation. Even though the second IPR was instituted for trial on claims 8-12 and 18-22 based on a broad construction of the claims, the claims were not shown to be obvious based on a narrowed interpretation of the claims adopted in the Final Written Decision. Are Patent-Friendly PTAB Decisions On the Rise? Patent litigation changed with passage of the America Invents Act. Overnight the PTAB became a new venue for challenging patent claims using IPRs, CBMs and PGRs. The initial reaction by the patent bar to the PTAB’s “take charge” approach to instituting review and canceling patent claims was met with approval by businesses under attack by patent trolls and with disdain by patent owners whose patents would have likely sailed through the assertion before the AIA. Some commentators blasted the PTAB for a high percentage of patent claims invalidated in PTAB proceedings. the patents under review were drafted to survive district court scrutiny and enjoy the presumption of validity and a clear and convincing standard of review (and many still are). Public sentiment was a moving target, but so was practice before the PTAB. After witnessing the PTAB’s heightened scrutiny of patentability, rather than file new suits many patent owners decided to wait and watch from the sidelines or take their assertions outside the U.S. Regardless, patent owners quickly learned the benefit of analyzing and selecting patents more likely to survive an IPR, CBM or PGR lodged by a defendant-petitioner before engaging in a patent litigation. Now, with PTAB institution rates moderating, it remains to be seen whether the Board is easing its scrutiny on patentability or whether higher caliber patent assertions are being lodged in view of that heightened scrutiny. 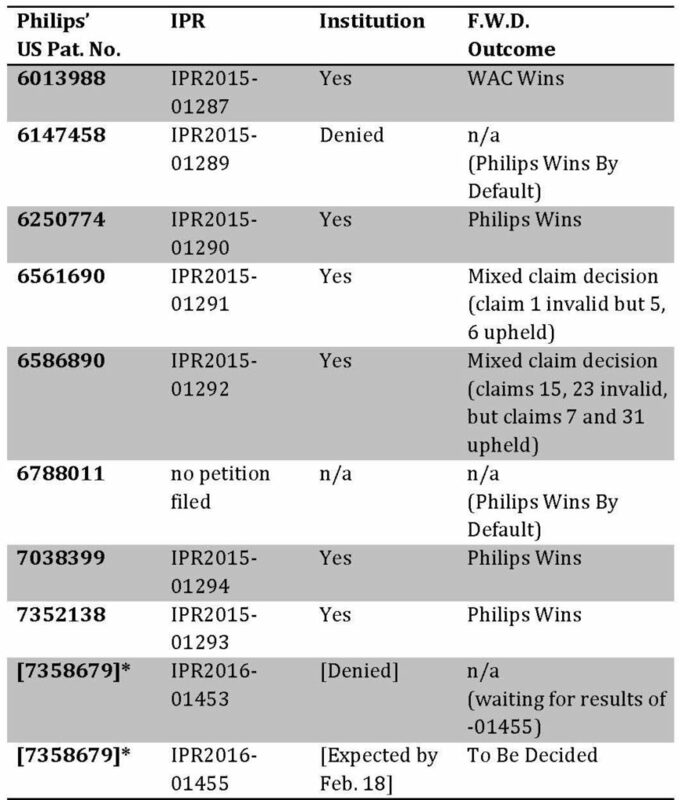 Philips has been embroiled in patent litigation with WAC since May, 2015. Koninklijke Philips N.V. et al. v. Wangs Alliance Corporation, Case No. 14-cv-12298-DJC (D. Mass.). Philips sued WAC for patent infringement of eight patents (not including the ‘679 patent) relating to lighting products and systems relating to LED lighting devices. WAC filed IPR petitions on seven of the eight patents, but obtained institution of only six of the seven IPR petitions. In January 2016, the district court litigation was stayed pending the outcome of the IPRs. WAC later filed two IPR petitions against the ‘679 patent. The ’679 patent does not appear in the litigation documents, but WAC identified it as claiming priority to U.S. 7,352,138 (which is in the litigation) and as related to U.S. 7,039,399 (also in the litigation). at least one controller coupled to the housing and the at least one LED and configured to receive first power from an alternating current (A.C.) dimmer circuit, the A.C. dimmer circuit being controlled by a user interface to vary the first power, at least one controller further configured to provide second power to the at least one LED based on the first power. WAC’s ’679 IPR petition was denied when the Board adopted a claim construction of “alternating current (A.C.) dimmer circuit” that was narrower than the one proffered by Petitioner WAC. * The ’679 Patent is not appearing in litigation documents, but a claim of priority from U.S. 7,352,138 and a relationship to U.S. 7,039,399 is noted in WAC’s petitions. The ’679 IPR outcome is not yet determined because even though the -01453 IPR petition was unsuccessful the -01455 IPR institution decision remains to be decided and is not expected until later this month. Note: several of these decisions are on appeal, so these are not final results. Philips’ IPR results are comparable to historical statistics when it comes to the number of IPRs instituted, but its results are substantially better than the statistical outcomes associated with IPR final written decisions from 2016 data. For example, early Board practice saw a very high percentage of IPR institutions (starting at ~90% in 2013 and dropping to ~70% in 2016). Upon institution, a patent owner’s chances of losing all claims if the IPR were to reach a final written decision would be roughly 70%. In this Philips case study, the percentage of IPRs instituted remains relatively consistent with IPR institution outcomes (ignoring the ‘679 IPRs because they are not yet final, we get 5 out of 7 IPRs were instituted or ~70% ); however only one of the institutions resulted in a cancellation of all claims, which is much closer to 17% than the 2016 expected 67% cancellation rate for IPRs instituted which end in a final written decision (again, the results of the Federal Circuit appeals will not be known for some time). However, the data also shows a mixed claim decision outcome in 2 out of 6 IPRs (~33%), which equates to roughly double the typical percentage of mixed claim decisions (typically ~15%). Of course, mixed claim decisions are very hard to evaluate, because one has to know which claims are more likely to be infringed with substantial damages to know if the mixed result was a winner or a loser for a patent owner. The Philips patent IPR outcomes are not yet final, but as of today Philips is substantially ahead of the 2016 percentages. Footbalance System OY sued Zero Gravity Inside, Inc. et al. alleging patent infringement in May, 2015 and filed amended complaints, including a third one filed on October 21, 2016. Footbalance alleged patent infringement of its US Patents 7,793,433 and 8,171,589. The patents related to apparatus and method for producing an individually formed insole. In response, Zero Gravity filed two IPR petitions challenging claims of each patent on August 19, 2015. Both IPR challenges failed. The ’589 IPR petition alleged obviousness of claims 1-3, but was not instituted in a Decision Denying Inter Partes Review dated January 13, 2016 (IPR2015-01770, Paper No. 17, January 13, 2016). The ’433 IPR petition was instituted based on alleged obviousness of claims 1-7, but on February 3, 2017, the Board found that Petitioner Zero Gravity failed to show by a preponderance of the evidence that claims 1-7 of the ’433 patent were unpatentable under 35 U.S.C. § 103. Footbalance managed to maintain its claims despite institution of the IPR. The Board decided Petitioner failed to show that the prior art taught “wherein the at least one layer of thermoplastic material is configured to reach out from under a heel of a foot only to the metatarsophalangeal joint of the foot”, as recited in Claim 1 (“the MTP limitation”). Petitioner’s contentions in its Reply also are not persuasive. Dieckhaus discloses that thermoplastic layer 6 “extends from the back or heel portion of the insole, to approximately just short of the ball section of the foot” [ ]. 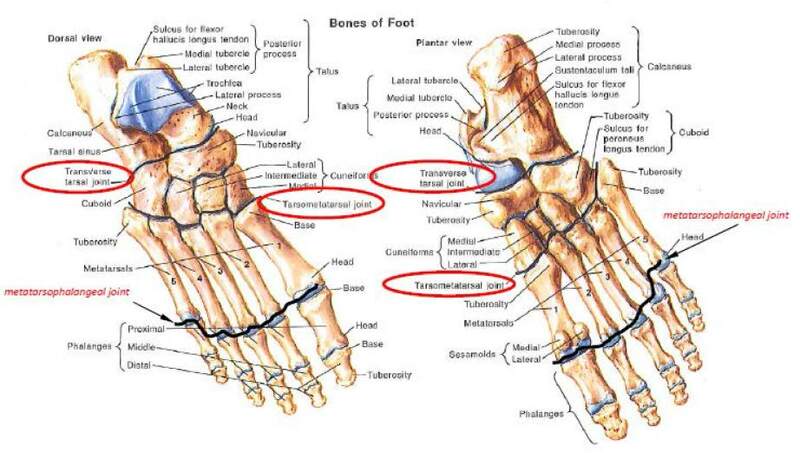 Approximately just short of the ball section of the foot is not the location of the MTP joints (i.e., the location of the heads of the metatarsal bones and the corresponding proximal phalanx). 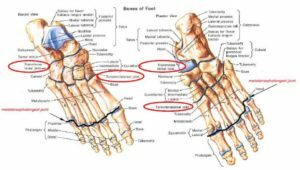 [ ] Further, Petitioner does not sufficiently show that it would have been obvious to one of ordinary skill in the art to modify Dieckhaus’s thermoplastic layer 6 to extend to, but no further than, the location of the MTP joint of a specific foot. Petitioner’s assertion that such a modification would have been obvious because Dieckhaus’s disclosure is “so close” is a mere conclusory statement. “To satisfy it burden of proving obviousness, a petitioner cannot employ mere conclusory statements. The petitioner must instead articulate specific reasoning, based on evidence of record, to support the legal conclusion of obviousness.” In re Magnum Oil Tools Int’l, Ltd., [cites omitted]. The Footbalance litigation is still in its very early stages, so it is too early to tell how the litigation may turn out, but the Board did not cancel claims from either patent. These recent outcomes do not establish a trend, but they do show that some patent owners are succeeding despite the heightened scrutiny of PTAB proceedings. They also show that the PTAB will provide relief to patent owners at both institution and final written decision stages of the PTAB trial. They also give lessons on better patent drafting, which will be the subject of future posts. Covidien LP had a license to U.S. Patent 7,062,251, owned by the University of Florida Research Foundation (UFRF, Patent Owner). UFRF alleged breach of contract by Covidien, and sued Covidien in Florida state court for breach of license. Covidien counterclaimed for a declaratory judgment that it does not infringe the ’251 patent, and removed the action to federal court. In June of 2016, Covidien (Petitioner) filed three petitions seeking inter partes review (IPR) of the ’251 patent. After the IPRs were filed, UFRF sought to dismiss the federal court action on the ground it was entitled to Eleventh Amendment immunity from Covidien’s declaratory judgment counterclaim. The District Court agreed with UFRF and remanded the action back to state court. Covidien’s appeal of this decision is pending in the Federal Circuit (Appeal No. 16-2422). UFRF requested a conference call with the Board to ask for permission to file a motion to dismiss the IPR petitions on the basis of sovereign immunity. The Board authorized UFRF to file its Motion to Dismiss, Covidien to file its opposition, and for UFRF to file a reply. The Board went through another lengthy analysis to determine that the UFRF is an arm of the State of Florida. For the foregoing reasons, we conclude that Eleventh Amendment immunity applies to inter partes review proceedings, and that UFRF, having shown it is an arm of the State of Florida, is entitled to assert its sovereign immunity as a defense to the institution of an inter partes review of the ’251 patent. Accordingly, the Petitions in IPR2016-01274, -01275, and -01276 are dismissed. The Board went through great lengths and 39 pages to analyze and document UFRF’s sovereign immunity claim. One has to wonder if the District Court decision remanding the case to state court weighed heavily on the Board’s decision to find sovereign immunity and dismiss the IPRs. It will be interesting to see whether the appeal of the District Court remand is maintained and if this Board decision is appealed. But at least for now, it appears that a state-owned patent will not be subject to IPR unless it has waived sovereign immunity. Many factors must be considered for due diligence and valuation of a patent portfolio. The patent owner’s desire to have broad claims that capture a large number of infringements must be tempered against its need for claims that will not be deemed invalid in view of prior art. Before the America Invents Act (AIA), patents were crafted to survive federal court scrutiny. An assertion of broad claims was more likely than sweating the details about validity because it was harder to prove a patent was invalid than it was to prove it was infringed. With the enactment of the AIA, the Patent Trial and Appeal Board (PTAB or Board) is empowered to review patent validity in administrative trials (AIA Trials). Patents are more readily invalidated in these AIA Trials using a lower burden of proof than required in federal district court. Furthermore, the Board’s administrative patent law judges have both scientific and patent law training, which enables them to scrutinize patents more carefully than a typical district court judge or jury. The “new normal” is that a patent’s validity is likely tested in the PTAB (in IPR, CBM, or PGR) before it is enforced in federal district court. Savvy companies are taking extra measures to review their patents carefully before acquiring and asserting them to reduce or avoid the cost and delay that comes with PTAB proceedings. WHAT ARE THE DOWNSIDES FOR PATENTS THAT ARE NOT AIA-READY? RISK: AIA Trials statistically favor the Petitioner/Defendant. Don’t invest in a portfolio or a litigation that won’t deliver value. DELAY: Patent Office Trials are one more reason for a stay of parallel federal district court proceedings. Justice delayed is justice denied. COST: Patent owners dragged into an IPR, PGR or CBM can expect six figure defense costs with the best-case outcome being that the claims are upheld—which is essentially the patent’s original status. rarely allowed in IPRs, CBMs, and PGRs. Don’t expect to fix defective patents without a lengthy proceeding that is conducted after the AIA Trial. HARM TO FUTURE ACTIONS: If claims survive the AIA Trial validity challenge, admissions may be made that could reduce the effectiveness of any district court infringement action. Poorly crafted patent claims are typically cancelled in an AIA Patent Trial. High quality patents are more likely to bypass review, and those patent owners avoid the cost, delay, and risk of defending weak claims in AIA Trials. To get a good read of a patent’s ability to survive AIA review, seek the opinion of patent counsel that is experienced in patent prosecution, patent litigation, and post-grant proceedings. In case you missed it, I put together a simple 2 minute video with 4 tips to make your patent portfolio AIA-ready. The America Invents Act (AIA) has changed the way that patents are enforced. In traditional patent litigation, a patent was drafted to perform in district court. After the AIA, when patents are asserted, they are first challenged in administrative proceedings before the Patent Trial and Appeal Board (PTAB). These proceedings, called IPRs (inter partes reviews), PGRs (post-grant reviews), and CBMs (covered business method reviews), are conducted by skilled administrative law judges who have both scientific and legal experience. Patents that fail in these more-stringent reviews will never get a day in court, so patent applicants should be adapting their patent strategies to make their patents AIA-ready. Check out our video for tips on how to make stronger patents that will withstand AIA reviews. The recent Supreme Court decisions in the Stryker and Halo cases just made it easier for courts to award enhanced damages in patent infringement cases, discarding Seagate’s “objective recklessness” test. In 2007, the Federal Circuit announced a test for enhanced damages whereby a plaintiff seeking enhanced damages had to show that the infringement of his patent was “willful.” In re Seagate Technology, LLC, 497 F. 3d, 1360, 1371. The Federal Circuit set forth a two-part test to establish such willfulness: First, “a patentee must show by clear and convincing evidence that the infringer acted despite an objectively high likelihood that its actions constituted infringement of a valid patent,” without regard to “[t]he state of mind of the accused infringer.” Id., at 1371. This objectively defined risk is to be“determined by the record developed in the infringement proceedings.” Ibid. “Objective recklessness will not be found” at this first step if the accused infringer, during the infringement proceedings, “raised a ‘substantial question’ as to the validity or noninfringement of the patent.” That bar applied even if the defendant was unaware of the arguable defense when he acted. Second, after establishing objective recklessness, a patentee had to show by clear and convincing evidence the risk of infringement “was either known or so obvious that it should have been known to the accused infringer.” Seagate, 497 F. 3d, at 1371. Only when both steps were satisfied could the district court proceed to consider whether to exercise its discretion to award enhanced damages. Ibid. The Supreme Court’s recent decision in the Stryker and Halo cases discarded the Seagate test and restored courts’ discretion to award enhanced damages. The Court held “[t]he Seagate test is not consistent with §284.” The relevant language of § 284 contains “no explicit limit or condition on when enhanced damages are appropriate, and this Court has emphasized that the “word ‘may’ clearly connotes discretion.” So the Court found no explicit requirement for Seagate’s “objective recklessness” test. The Court also found Seagate unnecessarily required a finding of “objective recklessness” even when wrongdoing was demonstrated by the facts of a case. The Court also disagreed with Seagate’s requirement of a “clear and convincing evidence” standard for showing recklessness, and held that the proper standard for enhanced damages was a “preponderance of the evidence” — the same standard as for patent infringement determinations. Section 298 provides that “[t]he failure of an infringer to obtain the advice of counsel” or “the failure of the infringer to present such adviceto the court or jury, may not be used to prove that the accused infringer willfully infringed.” 35 U.S.C. § 298. Respondents contend that the reference to willfulness reflects an endorsement of Seagate’s willfulness test. But willfulness has always been a part of patent law, before and after Seagate. Section 298 does not show that Congress ratified Seagate’s particular conception of willfulness. Rather, it simply addressed the fallout from the Federal Circuit’s opinion in Underwater Devices Inc. v. Morrison-Knudsen Co., 717 F. 2d 1380 (1983), which had imposed an “affirmative duty” to obtain advice of counsel prior to initiating any possible infringing activity, id., at 1389–1390. See, e.g., H. R. Rep. No. 112–98, pt. 1, p. 53 (2011). Consequently, nine years after Seagate, the Supreme Court has made it easier for courts to make a determination of enhanced damages. Time will tell if this decision will spur additional patent opinion practice, such as prior to the 2007 Seagate decision. On May 12, 2016, the Federal Circuit issued a decision on 101 patent eligibility that overturned a summary judgment finding of § 101 invalidity for software used for databases. Enfish, LLC v. Microsoft Corp., No. 2015-1244, 2016 WL 2756266 (Fed. Cir. May 12, 2016). The Enfish v. Microsoft decision interpreted the “abstract idea” first prong of patent eligibility under the Mayo/Alice line of cases. It reversed the district court’s grant of summary judgement based on § 101, finding that the data storage and retrieval system for a computer memory recited by five claims on appeal of U.S. Pat. No. 6,151,604 were patent-eligible. The Board was persuaded by Patent Owner’s assertion that the claims cannot be performed entirely by the human mind or with pen or paper, and that certain steps of the claims specifically call for operations that must be performed by a computer. We do not read Alice to broadly hold that all improvements in computer-related technology are inherently abstract and, therefore, must be considered at step two. Indeed, some improvements in computer-related technology when appropriately claimed are undoubtedly not abstract, such as a chip architecture, an LED display, and the like. Nor do we think that claims directed to software, as opposed to hardware, are inherently abstract and therefore only properly analyzed at the second step of the Alice analysis. Software can make non-abstract improvements to computer technology just as hardware improvements can, and sometimes the improvements can be accomplished through either route. We thus see no reason to conclude that all claims directed to improvements in computer-related technology, including those directed to software, are abstract and necessarily analyzed at the second step of Alice, nor do we believe that Alice so directs. Therefore, we find it relevant to ask whether the claims are directed to an improvement to computer functionality versus being directed to an abstract idea, even at the first step of the Alice analysis. Decision at p. 16 citing Enfish v. Microsoft at *4, (emphasis added). The Board concluded that the first prong of the Mayo/Alice test was not met. The Board also went on to find that the second prong of the Mayo/Alice test was not met, noting DDR Holdings. Consequently, the Board issued its order denying CBMR. As noted in earlier posts, the Board has been known to rapidly adopt decisions from the courts, and this case demonstrates the velocity at which decisions are integrated into practice before the Board. On April 1, 2016 the PTO published its final rule on Amendments to the Rules of Practice for Trials Before the Patent Trial and Appeal Board. A small correction to these Amendments was published on April 27. I presented a summary of these rule changes at the AIPLA Spring Meeting in Minneapolis, MN on May 18, 2016. The slides from my presentation are attached. The comments in the final rule make it clear that the PTAB will be publishing an updated Office Patent Trial Practice Guide to address these new rules and changes in practice since publication of the first Office Patent Trial Practice Guide. When patent owners sue an accused infringer for patent infringement, one way for the accused infringer to avoid liability is to show noninfringement of the patent claims. But if the claims are extremely broad, the accused infringer may find it difficult to prove noninfringement and instead may have to rely on a showing of invalidity to avoid liability. However, a showing of invalidity requires clear and convincing evidence, which is a high standard. Enter post-grant proceedings, which provide the petitioner (or “requester,” when employing reexamination) a lower evidence standard for patent challenges. Should the patent be subject to review under post-grant proceedings, the patent owner will likely want to avoid amendment if possible, because amendment that results in substantive changes to the claimed invention can trigger intervening rights, which may provide some reduction of infringement liability for the accused infringer should the claim be substantively narrowed in the post-grant proceeding. Stakeholders want to know how to determine substantive amendment, triggering intervening rights. For example, is substantive amendment to be measured by the claim construction standard typically used in the post-grant proceeding (currently “broadest reasonable interpretation,” but pending review by the Supreme Court in Cuozzo), or the claim construction standard used in district court (Phillips)? The Federal Circuit recently addressed this question when considering amendments made in reexamination for using the Phillips standard in Convolve, Inc. v. Compaq Computer Corp. (Fed. Cir., 2014-1732, Feb. 10, 2016). “A patentee of a patent that survives reexamination is only entitled to infringement damages for the time period between the date of issuance of the original claims and the date of the reexamined claims if the original and the reexamined claims are ‘substantially identical.’” R & L Carriers, Inc. v. Qualcomm, Inc., [ ]. “[I]t is the scope of the claim that must be identical, not that identical words must be used.” Slimfold Mfg. Co., Inc. v. Kinkead Indus., Inc., [ ]. As a result, amendments made during reexamination do not necessarily compel a conclusion that the scope of the claims has been substantively changed. [ ] This is true even where the claims at issue were amended during reexamination after a rejection based on prior art. Laitram Corp. v. NEC Corp., [ ] Rather, “[t]o determine whether a claim change is substantive it is necessary to analyze the claims of the original and the reexamined patents in light of the particular facts, including the prior art, the prosecution history, other claims, and any other pertinent information.” Laitram[ ]. In determining the scope of the claims, we apply the traditional claim construction principles of Phillips v. AWH Corp.,[ ] (en banc), paying particular attention to the “examiner’s focus in allowing the claims” after amendment. R & L Carriers [ ]; see also Laitram Corp. v. NEC Corp., [ ] (When an amendment is made during the reexamination proceedings to overcome a prior art rejection, that is a “highly influential piece of prosecution history.”). the original prosecution history of the patent, where the patent owner argued that the reason for the amendment. On their face, the original claims recite only “acoustic noise,” which could encompass any manner of acoustic noise, including that generated from the spindle. But when read in conjunction with the remaining claim limitations and in light of the specification and prosecution history, a person of ordinary skill in the art would understand the claims to be limited to seek acoustic noise. In sum, we conclude that the addition of the term “seek” before “acoustic noise” did not alter the scope of the claim. Here, the language of the claims, read in light of the specification and prosecution history, especially the applicant’s 2001 remarks and amendment, compel a conclusion that the claims as originally drafted were limited to seek acoustic noise despite the lack of an express recitation in the claims. The Federal Circuit reversed the lower court’s grant of summary judgment of noninfringement based on the lower court’s determination that liability was precluded by intervening rights. The Federal Circuit concluded that the claim scope prior to the amendment would have been interpreted to be the same as the scope after amendment using a Phillips construction based on the specification, claims, and prosecution history. Had the court instead relied upon the broadest reasonable interpretation from reexamination as its gauge, the claims would presumably have been deemed substantively different and the district court summary judgment would have been affirmed. Convolve allows patent owners an opportunity to avoid intervening rights when amended claims would obtain the same Phillips claim construction as the claims prior to amendment.